Wow! Let me start by saying I have read all books from this author, and was excited when I was asked to review this book as I adore all her books. When I finish her books, I am always more than satisfied with where her stories have taken me and their endings. This is the third book in the series. Even though I loved the first two books, this is without a doubt, my favourite one. Anguish is the type of novel that you can re-read and you’ll never get tired of reading it. This novel had me laughing out loud with some of the situations the characters find themselves in, and I have to say that I loved all characters in this book; not just the main ones. The prologue starts us off with Jaylah in a complicated situation that she can’t get out of, and all because of her ex. Jaylah! Oh my, what a strong, sassy woman and very loving, too. She applies for a job she thinks will get her out of her the state of affairs she’s in, only to find herself worse off than ever. She knows nothing about her looking after a baby, can hardly get her act together, so how can she possibly make this work? And to top the lot, her self-confidence isn’t high up on the scale when she meets her new boss either. Mack. A brown-eyed, moody bad boy biker who is struggling with life, has the shock of his life when a woman turns up at his door and hands him her sister’s baby and informs him that he is the father. She ups and leaves him with the baby he wants nothing to do with, so he hands over the baby to Jaylah. Throughout this novel you see family stick together throughout. However, there is more than the baby; event after event occurs. The sexual tension which builds up between boss and his employee, is nothing less than outstanding. You will smile, laugh out loud, and if you are like me, you will say, “Go girl, go!” Jaylah’s inner-strength won’t back down to this bad-humoured and pushy man who you can’t help but fall in love with. You’ll also wish you could take away his pain. Can they overcome everything that life is throwing at them, or is it time for Jaylah to work somewhere else with her heart in pieces? I can’t wait for the next book in this series and to meet all new and old characters again. I rate this book five stars and look forward to reading more from this author. MADE! This word takes on a new meaning in this angst-ridden story overflowing with hate and revenge. And above all, total obedience to the boss, Antonio DeMarco who runs La Cosa Nostra in Chicago, is never questioned. However, this is not his story; it is Corrado Moretti’s. Saying that, every minute detail regarding the author’s extremely well-developed characters has a justification in a strong storyline interwoven with fear. I felt this fear from the first chapter of a read which is so well structured and fast flowing, only to leave me utterly spent right up until the last word. Corrado never had a chance to have a normal childhood. Circumstances mould his personality, make him grow up quickly. His father, Vito, is far too busy making a name for himself in the hierarchy of the Mafia. His mother, Erika, not only abuses him, she deliberately takes away the only anchor he had. Katrina, his twin sister, feeding on her mother’s hate, does everything in her power to make her brother’s life more intolerable. Corrado learns quickly. To be seen but not heard, to obey and to honour his father, and more importantly, never to question becomes his motto. When problems arise in the ‘business’, these two young siblings are sent away for the summer. Reprieve from the chaos at home show Corrado how the other half live. He meets Celia and Vincent. Two normal kids who are loved unconditionally. Vito has ideas for his son. It’s irrelevant whether he is still of school age, he wants him by his side; show him the ropes in Las Vegas—slowly. Corrado is eager to demonstrate to Vito that he is a Moretti. Being sucked up into the world of violence and blackmail makes him grow older and wiser beyond his years. More than aware that once he’s in, means there’s no turning back. He does what is expected of him and does it well. Furthermore, he has no inkling that someone had been keeping an eye on his progress. That person will have a huge influence on his life. Against all odds, the father of the woman he has loved since his capability of comprehension, gives him his blessing. His unconditional love for Celia is so strong, so utterly innocent in his world of corruption, helps him to keep sane. I fell in love with her with her generosity. She tries hard not to pressurize him, has the patience of a saint; gives him a reason to live. I am a huge fan of the God Father by Mario Puzo. 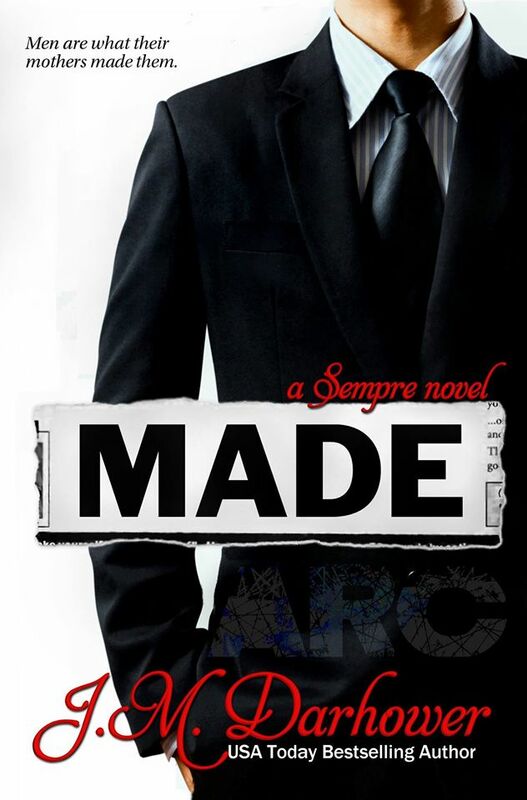 Even though MADE is about the Mafia, this book is on completely different lines. At not one instance did I doubt the comparable quality. The word epic is an understatement and certainly worthy of a movie. Such explicitly descriptive scenes come alive, and to say that they distressed me is putting it mildly. This book’s characters overwhelmed, drew me into their lives, and the man I should have hated, I adored, suffered and literally sobbed my heart out for. Calculatingly cold and seemly distant from everything that revolves around him, made me ask myself over and over again whether this man would able to he conquer his nemesis. My heart went out for his wife, her brother, for all his loved ones. I am writing this review with tears streaming down my face. Corrado’s story didn’t weevil its way under my skin. It touched my medulla. Ms. Darhower, you are a storyteller par excellence. Bravo!